NLP | Neuro linguistic programming was created by Dr Richard Bandler and John Grinder. 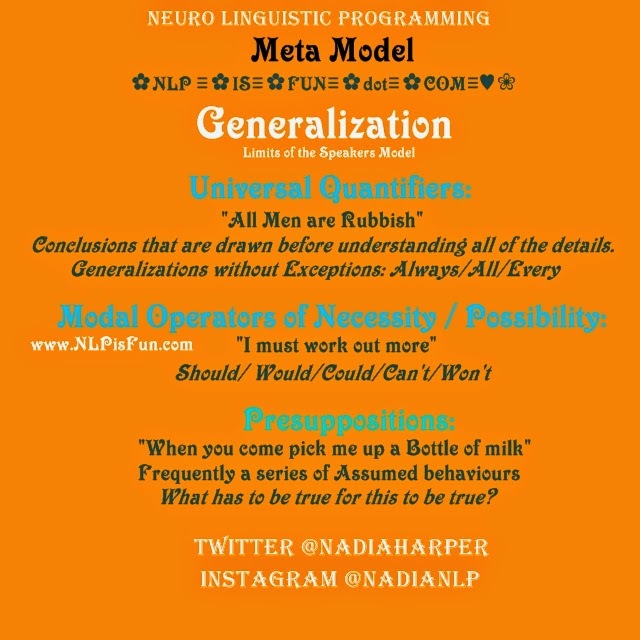 The Linguistic are of NLP has a series of Language Patterns called The Meta Model which is extremely specific. The Meta Model Challenges the person who is speaking to clarify what exactly they mean whenever they communicate with ambiguity. "He always walks so slow"
"It is the same routine every day"
"All Fat people are happy"
"He Never says I am pretty"
"There are no nice girls here"
Generalized assumptions that limit choice and influence other people as if they are Rules. "I Can't come right now"
"I Could come after I have finished the dishes"
"I Couldn't come before, because I was doing the dishes"
What would happen if you didn't ? What Wont happen if you don't ? What wouldn't happen if you didn't ? What won't happen if you do ? "Since you have got allot out of this, you may as well share it with somebody else"
"You will be far more empowered after learning these patterns"
"When you review them all in sequence they will make so much more sense"
"Because you like NLP stands to reason you will love being a Practitioner of NLP"
"Since you love the way I simplified it you will probably want me as your Trainer"
"Now you realize I am such a thorough NLP Trainer you will probably take your NLP Master Practitioner with me too". "Since you are going to do it anyway you may as well Book it Now"
"Being in the Entertainment capital of the world can only be considered a Plus while you are taking your NLP Practitioners Training with me"
"The Next stage of Training is knowing what you know about NLP and How to use it"
"Because these patterns are so easy to use you probably can think of ways you can use them even now". "Now that you have enjoyed this post so much you may as well share it"
"What has to be true for this to be true" ? NLP Presuppositions can also be found in the Milton Model and they are extremely Persuasive. Co Creator of NLP Richard Bandler says, stack as many of them as possible, to bypass the critical faculty and Melt resistance. Thanks for reading, See you for the next Blog post in Meta Model series which will be all about the NLP Meta Model Distortions.